Sleek lines, a gracefully curved windshield and spacious modern accommodations make the 30' Prestancia one of Doral's most popular models to date. With no interior bulkheads, the interior is wide open with privacy curtains for both staterooms, full galley, stand-up head, and a U-shaped dinette that converts into a huge 6-foot, 8-inch double berth. Seating for six is provided in the cockpit (a bench seat is hidden in the transom), and a convenient hot-and-cold shower is recessed into the transom as well. This freshwater Doral 30 has been well maintained and is currently in excellent running condition. The starboard engine block and manifolds were replaced in 2009 due to freezing (repair invoices available) and that engine has since logged 200 trouble-free hours. 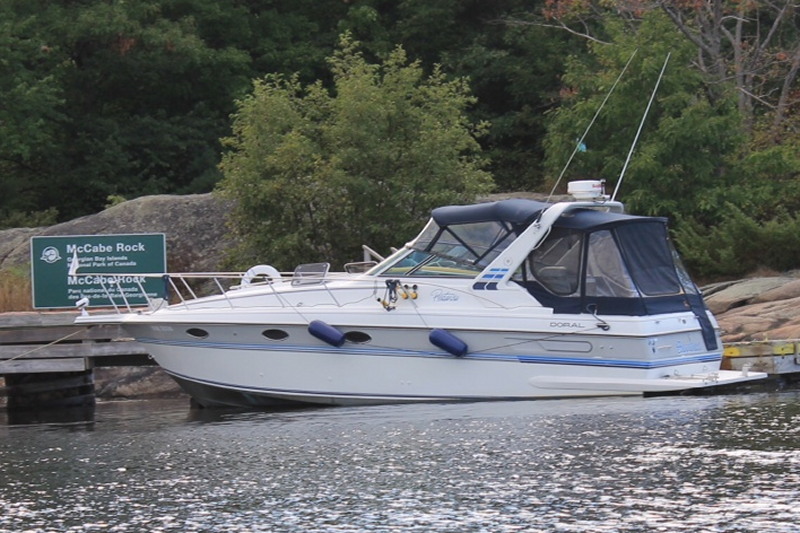 She is priced for quick sale as the owners have recently purchased a cottage.